3 - K-8 U.S.M.C. 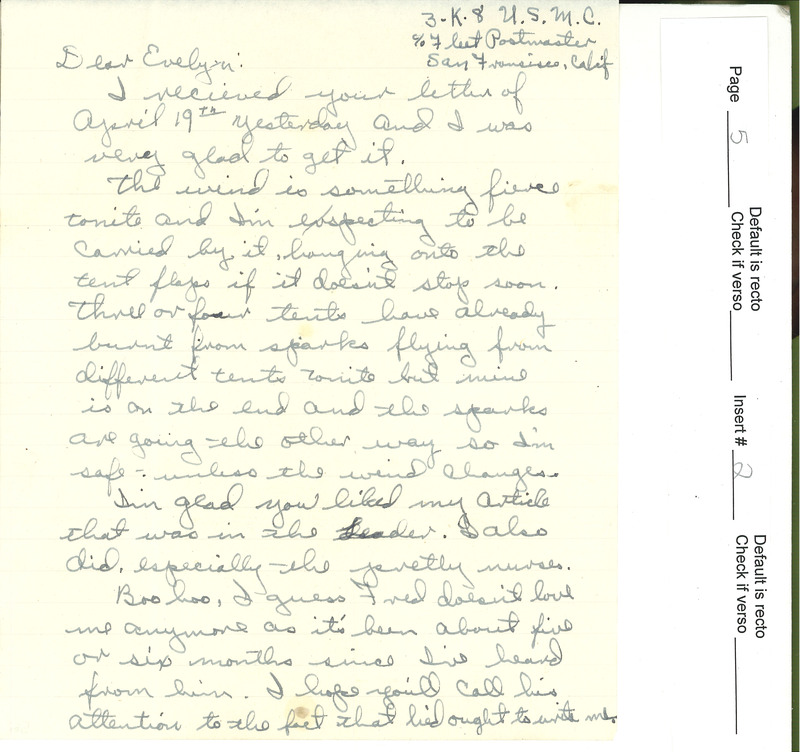 c/o Fleet Postmaster San Francisco, Calif Dear Evelyn: I recieved your letter of April 19th yesterday and I was very glad to get it. The wind is something fierce tonite and I'm expecting to be carried by it, hanging onto the tent flaps if it doesn't stop soon. Three or four tents have already burnt from sparks flying from different tents tonite but mine is on the end and the sparks are going the other way so I'm safe - unless the wind changes. I'm glad you liked my article that was in the Leader. I also did, especially the pretty nurses. Boo hoo, I guess Fred doesn't love me anymore as it's been about five or six months since I've heard from him. I hope you'll call his attention to the fact that he'd ought to write me.